Product prices and availability are accurate as of 2019-03-06 18:49:43 UTC and are subject to change. Any price and availability information displayed on http://www.amazon.com/ at the time of purchase will apply to the purchase of this product. 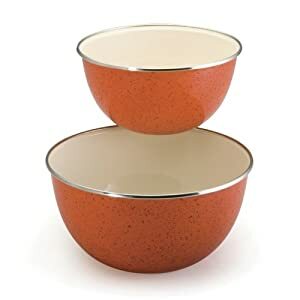 Includes: 1.5 quart and 3 quart mixing bowls Colorful speckled porcelain enamel adds a little Southern Charm to your kitchen. Perfect for mixing, prepping, storing and serving. Stainless steel rims protect the bowls against chipping while stacking and storing.